MacBook Pro refresh for mid 2012 went wild. With introduction of new Retina display MacBook Pro, Apple did upgrade the other traditional MacBook Pros too. This refresh is considered the biggest of all as Apple refreshed its MacBook family including the MacBook Air. Read: Latest version of Ccleaner for Mac is now available to download. Intel’s all new Ivy Bridge based CPUs were the focused refresh lineup along with the Kepler based GPU and USB 3.0 addition. These new additions have considerably increased the performance then the predecessors, along with these there are several minor additions and changes. 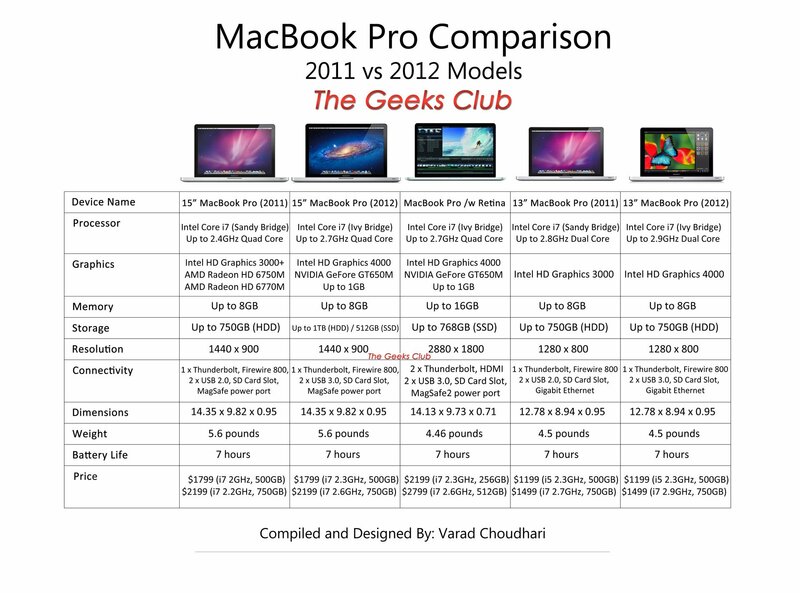 Have a look at our MacBook Pro comparison chart. Read: Drawbacks of MacBook Pro with Retina Display. Click image to expand and view in full size. Click the image again to magnify it further. 2012s non-retina models of MacBook Pro has been updated with the Ivy Bridge chipset with increased clocks in every model. The onboard Intel HD 3000 graphics has been replaced with the new Intel HD 4000 which comes along with the Ivy Bridge CPUs. This onboard graphics won’t matter much for the 15inch users as they have much powerful alternative, but 13inch users will experience significant increase in the graphic performance. Read: Do you really need the new MacBook Pro with Retina Display? The AMD GPU lineup of 2011 is replaced with NVIDIA GPUs for this year. This new GPU is based on all new Kepler architecture and is the only GPU option available. There is addition of USB 3.0 ports which make data transfer much faster giving you the total balanced performance. Cosmetics, dimensions and weight of all the non-retina models remains the same. Even after including new and better hardware the battery backup is 7 hours and is as same like its predecessor. The 17 inch model of MacBook Pro has been discontinued completely. To take its place Apple has introduced a new 15 inch Retina Display MacBook Pro. Read: MacBook Pro with Retina Display: All you need to know. We have already covered Apple MacBook Pro with retina display in details. Here’s all you need to know about Apple MacBook Pro with Retina Display. Is it really necessary for you? And its drawbacks. Are you going for MacBook Pro this year?